Beehive: TVD era has ended! Hello. 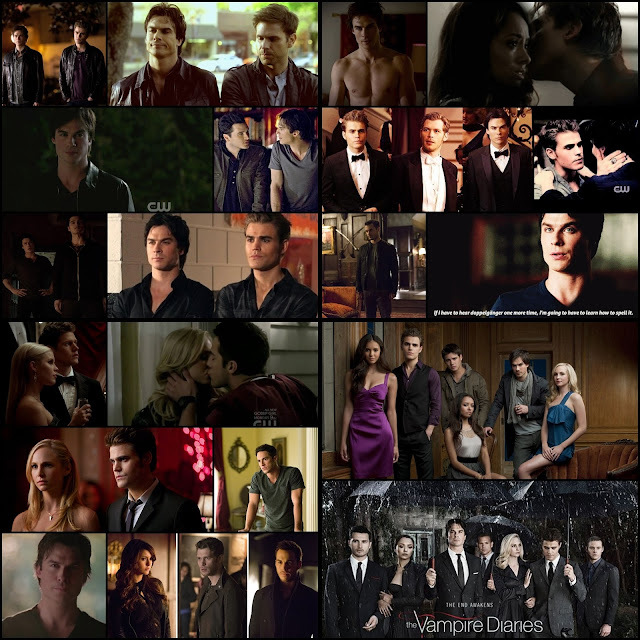 For all of us TVD fans, an era has come to an end. I'm writing this just now because I actually just watched the last episode. I've written one other post mentioning this show, but I never really talked about it. I won't go into much detail cause that would seriously be too long. I'm just gonna write down some of my thoughts. Also, have in mind I'm not a freak fan and I forgot some things, but that's OK. Also, this list has no order. As written in my linked post, I was on team Damon since the first scene. Stefan is the ultimate good character. Alaric and Caroline were the weirdest "couple" ever. He was their teacher at one point. Caroline and Klaus were great together. I loved the development of Klaus when he was with her. Also, that note in the lase episode - how cute! Katherine was so freaking annoying. I actually really liked Kai. Lexi and Stefan were great (friends) together. Seeing them together in the end makes me really happy. Jeremy and Bonnie were a weird couple. I'm so glad Matt didn't turn out to be anything supernatural. I'm also glad Matt got to know his history and heritage. Friendship between Bonnie and Damon was just great. Alaric and Damon were also great together. I'm kinda sad that Stefan didn't have friends like Damon had Rick and Bonnie. Stefan and Caroline were a weird couple at first, but I really liked them together. I loved the friendship between Damon and Liz Forbes. The plot with Salvatore mother was so boring and unnecessary. It only made the brothers sad. I also hated the whole "family" that came with her. I really liked the original family, especially Elijah (and Klaus, of course). Relationship between Elena and Damon since they start dating evolved so much. I think Damon is the character who has grown the most. My most memorable line is, of course, "Hello brother." I'd love to go on a road trip with Damon. I'd love to have a glass of bourbon with Damon. I never understood why Damon and Stefan haven't seen each other for 15 years before the show starts. They love each other to death. Couples I also liked are Caroline and Tyler, also Matt and Rebekah. "When people see good, they expect good. And I don't want to have to live up to anyone's expectations." (S03E19) This is the moment when Delena kinda starts, and I love the quote. The number of good things Damon did for Elena, Stefan and the rest of the gang that went uncredited is too big. That's one awesome Salvatore mansion. Becoming a vampire is supposed to be very difficult and painful process, yet Caroline had no problems. Somewhere in the season 2, Damon says he'll gladly let Bonnie die if he has to, but that friendship came out to be one of the strongest in the show. I never missed Elena. I was so glad she was gone. My ultimate favorite thing about this show is the love between Salvatore brothers. Last name "Salvatore" sounds so royal. One last bonus fact: I cried during last episode. Which I also have mixed feelings about - ending with narration and everybody dying?? Also, why are they all parting their ways if they can all be together after death?